I used Gavin Boyer with Touch of Green Lawn Care for years. He was prompt, friendly and he usually had one or two guys with him and they'd even shovel out my carport and clear off the walkway (not part of my "package.") Plus, you have his cellphone and can call him if you'd rather he not come, or if you want him early in a smaller snowstorm. I think it depends on where you live. 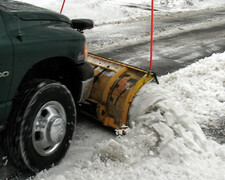 A "little guy" in Guilderland isn't driving up to Saratoga to plow your driveway. Would highly recomend Skyview Landscapes, fairly priced and reliable. Since this will be my first year out of the snow business in quite some time, I can give you a truely unbiased opinion. Call around, this is a great time of yearto get an estimate. Get proof of insurance, this is a big deal and alot of "plow guys" don't carry any. Get references if possible. If you choose to go with a seasonal price, upfront, make sure you have a signed contract...nothing worse then realizing you got scammed when your late to work with a foot of snow on your driveway. Don't always go with the cheapest quote. It's worth it to pay for professionalism. Have a conversation with the contractor. Some know the business, some really don't. There's a big difference between a "plow guy" and a snowcare professional. Albany Nursery on Delaware Ave. offers a winter package w/ upfront payment and contract, unlimited visits in small or large snowstorms. We've used them and they are reliable! I think the seasonal rate is around $400, if memory serves.
" the seasonal rate is around $400"
As a teenager I would kill for an opportunity to shovel someone's driveway a dozen times a year for this amount of money.